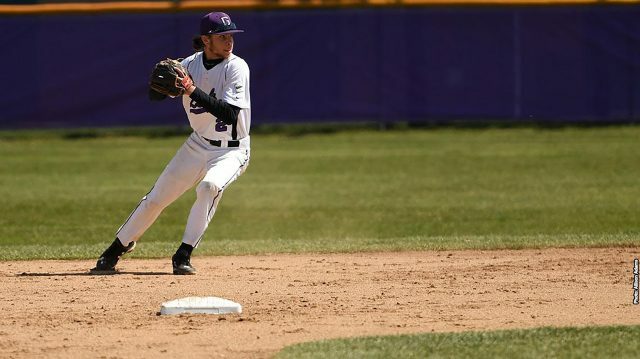 Mother Nature cooperated momentarily for the Maple Leaf baseball team this past weekend as they traveled to Fairborn, Ohio to take on the Cardinals from Concordia University in a back-to-back doubleheader. Sophomore Camm Nickell took the mound in the opener for the Leafs, striking out four over three innings while giving up two earned runs. The Leafs’ bats got going early as junior shortstop Mitchell Wilson drove in the first run of the game with a double in the top of the first. The Cardinals responded quickly with three unearned runs off one error in the latter half of the inning. In the bottom of the second, a two-run bomb from the Cardinals center fielder Blaine Milheim opened the gates for the Concordia offense as they jumped out to an early 5-1 lead. Nickell dealt a perfect third inning to keep the Leafs alive heading to the fourth, but a 1-2-3 inning in the top of the fourth left the door open for the Cardinals to extend their lead. A few errors from the Goshen defense lengthened the fourth and eventually loaded the bases for first baseman Grant Steinborn. He took advantage and drove in two unearned runs with a single, increasing the Cardinals lead to 10-1. After a hot start, the Cardinals pitching staff shut down the GC hitters, giving up just two more hits for the remainder of the game. Concordia tacked on two more runs in the subsequent two innings, putting the game out of reach. While Wilson had the only run for GC, sophomore Brighton Schofield reached base twice. Goshen dropped the first game of the doubleheader, 12-1. Early woes for the Maple Leafs proved lethal in the second game as the Cardinals picked up where they left off, scoring three runs in the first off of two hits and one error on the GC defense. Sophomore starting pitcher Kyle Staelgraeve buckled down after a rocky first inning and dealt a gem in game two of the doubleheader, giving up just three earned runs in four-and-a-third innings of work. In addition, Staelgraeve struck out five of the 18 batters he faced. Back-to-back singles from sophomore Bobby Garcia and junior Colby Malson to open the third inning threatened the Cardinal defense, but a 6-4-3 double play stranded Garcia on third base. First-year Cade Gorman came on in relief for GC, shutting down the Cardinals’ bats in just over one inning of work. But the offense could not get jump-started, remaining scoreless over this same time period. Again, it was a story of shut-down pitching from the Cardinals as Steinborn dealt five scoreless innings, allowing just five hits and no walks. Reliever Tyson Kleinfelter finished off the game with two perfect innings, striking out two. Five singles from five different Maple Leafs was not enough in the end as they dropped the second game, 4-0. The two scheduled games on Sunday morning were postponed due to inclement weather and will be played at Sarge Yoder Field in Goshen on Wednesday, Apr. 3. Goshen is set to take a long road trip in the upcoming week as they travel to North Carolina to take on Montreat College in a tripleheader Saturday and Sunday. They will then play Southern Wesleyan University in South Carolina the following Monday before traveling to Madisonville, Tennessee and Toccoa, Georgia the next two days.